The amount of literature that has been published on virtual reference is staggering, and what has been published on web-based chat and instant messaging (im) as vehicles for reference is voluminous. Although from the quotes above and much of the literature that has been written, you might get the impression that offering reference services via chat/im is a “no-brainer”. 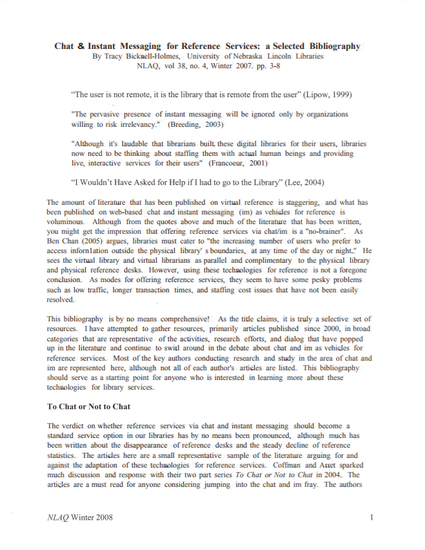 As Ben Chan (2005) argues, libraries must cater to “the increasing number of users who prefer to access information outside the physical library’s boundaries, at any time of the day or night.” He sees the virtual library and virtual librarians as parallel and complimentary to the physical library and physical reference desks. However, using these technologies for reference is not a foregone conclusion. As modes for offering reference services, they seem to have some pesky problems such as low traffic, longer transaction times, and staffing cost issues that have not been easily resolved.